The Visiola Foundation’s STEM Summer Camp is an exciting week-long residence program designed to pique the interest of women in the STEM fields from an early age. The Visiola Foundation is committed to nurturing, mentoring, and educating high-potential girls and young women in the STEM fields to build a pipeline of leaders and innovators who will help to transform African countries. Although there is a rise in the percentage of women enrolling in tertiary education, the gender divide remains wide and is further amplified in the STEM fields. The decision to abandon the study of STEM subjects is often made by the secondary school phase. The Foundation seeks to address this issue head on, by attracting teenage girls into the STEM world during this critical formative stage of their lives. During the summer camp, students learn valuable skills in critical thinking, problem solving, and teamwork as they are taught to view the world through the lens of STEM subjects. They essentially receive added tools with which to succeed in their future careers. The aim of the program is to encourage more women to pursue STEM careers by gaining their interest early, building their confidence, and facilitating their success. The summer camp comprises engaging classroom coursework, practical team activities, stimulating games, and a group project. Students learn basic concepts in computer programming, science, math, and engineering, all while having fun! The 2018 STEM Summer Camp themed “Solar Power for Nigeria” took place on August 11th – 18th, 2018 at Tech Specialist Academy in Abuja. Join us in 2019! Connect with us on Twitter for updates! 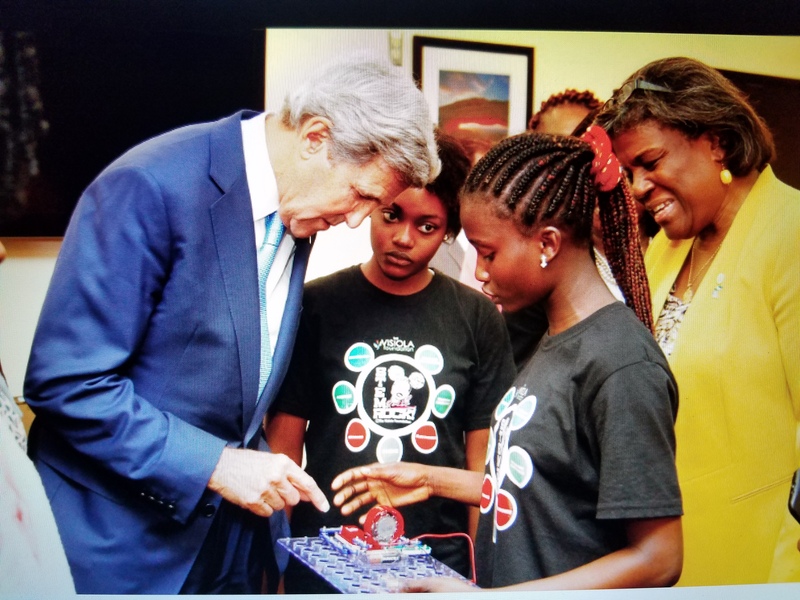 Ruth and Jessica, two participants of our 2016 STEM Summer Camp had the privilege of presenting the robotic forklift and salt water alarm projects to U.S. Secretary of State, John Kerry, during a Roundtable Meeting in Abuja on August 24, 2016 to discuss the importance of educating girls and of getting them into the STEM fields.